Amazon Timber Frames (ATF) is the world’s premier supplier of precision handcrafted timber frames made from Brazilian hardwoods, supplying both commercial and residential markets. While this fact may throw up a “save-the-rain-forests” red flag for some, the Michigan-based company, founded in 2002, is actually fervent about preserving Brazil’s greatest natural resource, upon which its very existence depends. ATF takes every opportunity to increase awareness of the Amazon’s plight. ATF’s source for quality hardwoods is land that has been legally designated by the Brazilian government to be cleared for mining or agriculture. The majority of the logs purchased by ATF come from Porto Trombetas and Juruti, two communities deep in the Amazon Basin that are home to the largest bauxite mining operations in the world. Bauxite is the raw product that is refined to make aluminum. A typical bauxite deposit might be 25 feet below the surface of the forest, and the deposit may be as thick as 50 feet. To get the bauxite out of the ground, the forest needs to be cleared. But before this is done, the mining companies’ forestry specialists analyze just what species are on each tract to be cleared. The mining companies are making a concerted effort to replant the land when they are finished mining. The same species of native trees, that existed before clearing, are grown in company greenhouses for replanting after the bauxite has been removed. In addition to replanting trees, ATF’s supplier in Porto Trombetas, Mineracao do Rio Norte (MRN), has also cleaned up a polluted lake in the area, earning its operation the coveted ISO-14001 certificate, the first issued to a Western Hemisphere mining town. In today’s world, aluminum is essential. It has to come from somewhere. The reality is that these mines exist and will continue to exist. The mine in Juruti is new and will be in operation until mid-century or beyond. The mine in Porto Trombetas has been operating since 1979 and is projected to be in operation for another 30 years. There will be millions of logs available from these two projects for years to come. The question is not whether trees will be cut, but rather what will happen to them afterward. If the logs that have to be cut to mine bauxite were not used by an entity like ATF, they most likely would be buried, as was the practice in Porto Trombetas for the first 30 years of the mines’ operation. ATF’S purchase and use of these byproducts of the mining and farming operations amounts to a major recycling program. Porto Trombetas is a perfect example of the environmental awareness that ATF demands in its business associates. No roads have been built to connect this remote town to the outside world, because of the fear that they would bring more people and thus more infrastructure, which would inevitably lead to increased deforestation. The 6000 inhabitants enjoy fresh drinking water as well as sewage and garbage recycling systems. They even have their own power plant, a school and a 32-bed hospital. Juruti adheres to a number of sustainable development practices, having implemented programs such as climate, noise, water and air quality control, flora conservation, monitoring of animals, insects and fish, environmental education, reclamation of altered areas, solid waste management and environmental emergency control, among many others. ATF is committed to environmentally friendly business practices and developing programs that allow it to provide an incredible product while having as little impact on the environment as possible and helping to promote sustainability. This includes providing good jobs with excellent benefits for Brazilian families that allow them to enjoy a higher standard of living. In turn, these people are more likely to lead a lifestyle that puts less stress on the environment. Looking ahead to the future, ATF sees the possibility of starting a selective tree harvesting program that would have little or no impact on the forest. ATF partner ZIB has already acquired close to 2000 acres of prime forest land once destined to become one of the many large-scale farms so common in the region. There are 1200 known species in this area. The typical timber operation in that part of Brazil focuses on no more than five species and seeks only the largest and finest logs, since they yield the most high-grade timber. ATF, on the other hand, takes a different approach, avoiding the exploited trees and focusing on long-term, selective and managed harvest of the other 1195 species that inhabit the forest. The company is also avoiding the “granddaddy trees,” since those that are perfect for timber frame structures need only be straight and of average size. 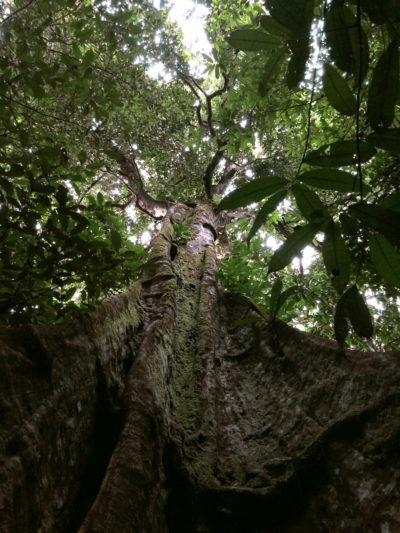 With a 30-year cycle of low-impact harvest of average-size trees in a multitude of species, the forest would be left largely intact – and, most importantly, the largest, old-growth specimens that make the forest special would be spared. Land that is put aside for selective harvest forestry is often land that would otherwise be converted for another use. Almost all other uses, including farming and cattle ranching, mean complete forest removal and a very high carbon footprint. In the case of the land that ZIB now possesses, not a single tree would be on it, had it not been purchased by ZIB. The common thread running through everything ATF creates from Brazilian hardwoods is that it is all incredibly beautiful. But in keeping with the company’s environmental consciousness, that beauty is more than skin deep. Homes and commercial buildings are very energy efficient – the panelized system used for exterior walls and roofs has a very high insulation and safety rating. The timbers used for construction are also naturally decay resistant, requiring no chemical treatment of any kind and thus avoiding chemical leaching into ground water or runoff into lakes and rivers. And, of course, there is the human and economic sustainability factor in these products’ country of origin. Brazilian hardwoods may come in a variety of colors, but in the hands of Amazon Timber Frames, they’re all green!